Earlier this month, we shared a selection of art pieces from God of War Art Director, Raf Grassetti, all of which were coming together to make a realistic-looking set of designs for characters from Super Smash Bros. Ultimate. Whatever your thoughts on the designs, it's undeniable that an awful lot of talent has gone into each piece's creation, and now we have another handful to look through. Originally, Grassetti was somehow managing to upload one new image per day - presumably on top of all those pesky life commitments. Things have slowed down a little since then, but his followers are still being treated to some great pieces. If you missed the first set - which included Samus, Link, Star Fox, Bowser, and Sonic - you can check those out right here. If you're all caught up, here are another six. If you scroll through the images uploaded on this Diddy Kong piece, you can see some cool, alternate variations. You can view the collection in its entirety, and keep an eye out for future pieces, by following Grassetti on Instagram. Do you have a favourite design? Are you as impressed with Grassetti's work as we are? Let us know your thoughts in the comments below. Ridley is interesting, with that physique he reminds me more of Firebrand, or Red Arremers. Nobody doubts the man's artistic talent of course but i've found the majority of them jarring and off-putting. Ridley is definitely the best of the bunch so far, Samus and Pikachu are alright. Diddy and Mega Man especially. Couldn't help laughing. That design of Mega Man looks really good. Ridley looks like a gothic gargoyle, it's really cool! DIDDY THOUGH. OH MY GOSH. My favourite so far has to be Pikachu though. Kind of prefer this one over the Detective Pikachu one. That Ridley and K Rool look so freaking cool. Well I know what I'll be having nightmares about tonight. Nope, still lifeless, flat and off-putting I'm afraid! I think these are all amazing...except Mega Man. That one just looks plain wrong to me. I have to say the Pikachu one is my most favorite out of all of them. I guess Diddy would be the first chimp with a tail. That K Rool and Ridley though. Excellent work! They're artistically solid, but they all seem incredibly generic. Samus looks like a run of the mill soldier that could be in any sci-fi game or movie. There's more to art than striving for realism. I love all of the drawing but there is one thing about ridley that made me think about it I don't know why. I have yet to see a 'realistic' representation of Mega Man that looks good and this one doesn't break that. Just looks...wrong. Woah a hairy Mewtwo. I always thought of him as hairless. Megaman has little Trump hands lol. That's not really how I would potray Ridley. He's basically a mix of xenomorph and pteranodon, that's what he should look like. Still looks awesome though. Fur on Mewtwo is uncomfortable. @edgedino and i thought jigglypuff was hairless too. Then saw the detective pikachu trailer and the nightmare started. I think King K. Rool is my favorite in this batch. @Venus_Adept actually jigglypuff always had hair hence the swirl. I have to agree with the majority of comments up to this point not a big fan of these . @Yosher : You beat me to it! This is a "realistic" Pikachu that I can get behind. Hollywood's Detective Pikachu is absolutely hideous (and by extension, every other Pokémon depicted in that, especially Mr. Mime and Jigglypuff). All still a little creepy and uncanny valley, like the kind of thing you might have seen if these were American box art images for a SNES version of this game back in the day. lol But still cool stuff. These are great...but anyone else think this is leading up to potentially one of the best April Fool's jokes ever. King k. Rool is my favourite too. I think they all look great, obviously I prefer the original designs by a mile. In my opinion Breath of the wild has better graphics and art direction that the tecnical marvel that is Red Dead Redemption 2, simply because in 10 years Red Dead will look outdated (realistic graphics always do down the line). But BOTW will continue to look as good as today (the wind waker effect). All and all I am glad nintendolife highlighted this guy work, otherwise I would have never discover it. Mewtwo is simply awesome. It is probably the best artwork featuring mewtwo I've ever seen. I would love to see mew too, even if it is not in smash. @Folkloner Somic was off putting - not to mention the face / abdomen is supposed to be hairless if based on the character.. But Bowser looks fantastic! @Thumbsofsteel What about Sonic? That one looks terrible - Bowser and Fox look great though. Ironic that Link looks like the very person who emulates him... A cosplayer. Waiting for Mr. Game & Watch. Man, Bowser and K Rool look a lot more menacing this way. I guess they should though. Mega Man looks like a live action version of the American cartoon from the 90s. "Super fighting robot... MEGA MAN!! I think they look crap and generic, lacking any sort of character. Diddy looks just a chimp, dressed like Diddy. Mega Man looks a non descript dwarf, dressed in a tin suit, King K Rool looks a crocodile in a crown. Detailed? yes. And sort of style or artistic merit? No. I actually believe Mewtwo is hairless not in a weird anime kind, more like the even weirder Sphinx cat that in real life doesn't have hair. Still all his arts look awesome even with extra fur. @Silly_G I have to be honest and say that I don't think the movie depictions are necessarily ''hideous''. At least, not after I've gotten more used to them. They're still my least favourite official depiction of Pokémon ever though, but I don't necessarily hate it. Would definitely have liked it more if it was more in the style as the Pikachu depicted here, of course! Don't stop, Grasseti! Don't stop! Neat, but there is a lot of awesome fan art out there. Better fan art than this in my opinion. But those "normal" artists aren't worth a feature I suppose, since they didn't work on God of War. @edgedino but is just the swirl not the whole body. The design concept of jigglypuff is a pink balloon even the pokedex says "balloon pokemon" and being so hairy remove the essence of that pokemon. At least thats my opinion. Scary and funny all at the same time. @Heavyarms55 What is your definition of 'normal'? @FTL Bowser’s probably my favourite out of all of these. I didn’t think Sonic looked that bad...other than looking cockeyed. To be honest I’d take that Sonic over that Mega Man any day lol). @Wasp Non-celebrities. People who haven't gotten their names attached to some award winning work already. There are countless examples of talented artists out there, producing all manner of original and fan artwork. Obviously this site, or others couldn't feature them all, but they could feature some if they wanted. But they don't, not unless their name is attached to something big, like God of War, to gain clicks. They all do look amazingly detailed, but I do have one problem. Diddy is suppose to be a monkey, not a chimp. There's a big difference between the two. Monkeys are the ones with tails and a smaller frame while chimps are larger, have a more humanoid shape, and most importantly, are tailless. I know a few people here already mentioned this, but the consistent misunderstanding in the difference between them all is annoying. @Joeynator3000 I wanna see Pac-Man. I just realised how much DBZ is there in the Mewtwo design. I know, I am a slow guy. 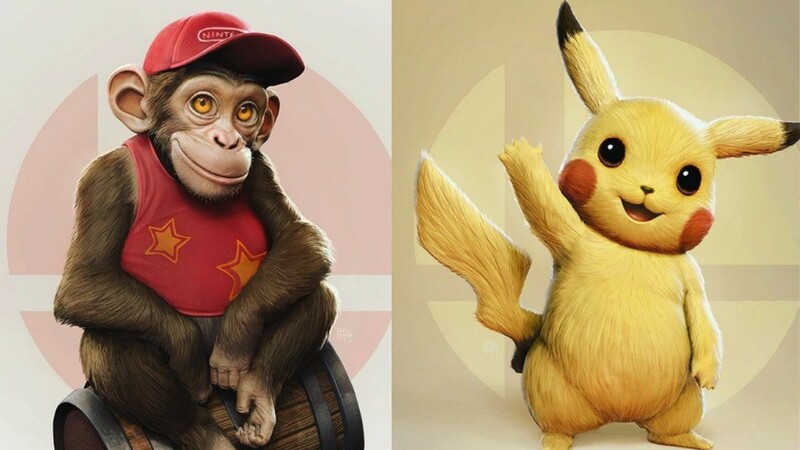 Diddy Kong would always look weird, since he's apparently half-chimp and half-monkey. He still looks playful and silly though in this image, but making him realistic just highlights how little he has to do with the actual animal. Kind of like Rafiki in The Lion King is half-baboon and half-mandrill and the new "realistic" version is showing that he's not a real animal. Brilliant work, hope to see more of these! Basically, he's given the characters the PlayStation treatment. I wonder if PushSquare has articles on this? Given the sass that came out of their answer to our article, I'm both scared and intrigued by the thought of it in equal measure. These are interesting, but I can't say I'm a fan of most of them. You can definitely tell what type of characters he's use to designing, because he seems to like putting abs and human-like muscles on a lot of them. In regards to detail, it's definitely impressive. But you can tell he's not a huge Nintendo nerd, because a few of his rather big character details are off. The most perplexing one, to me, still has to be Fox though. He took a very lightweight and agile character. Then gave them the bulk of a body builder, for some reason. I'm not sure how that makes him more realistic. @Paraka makes him more like an embryo since we all are covered in a thin layer within the womb. It's painfully obvious how this will all end. The final piece of art is a character that is NOT realistic, but instead slightly more cartoony than usually seen. It is KRATOS, followed by his Smash Bros character reveal trailer!! @Agramonte It's going to be God of War 2 (202X). Not to be confused with the actual God of War 2 (2007) as God of War 2 (202X) is actually God of War 5. That Ridley is spot on, and Mega Man is very interesting... But that Mewtwo with fur...? My OCD also can't get over the fact of how the "Nintendo" logo's text is in all caps on Diddy's hat. That's just not right. The graphics and designs are very awesome, almost all the design looks interesting. I represent a blog: https://lindagist.com feel free to visit to read articles if you want. Thanks. 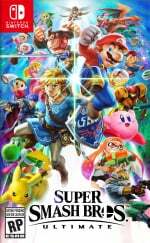 what smash will look like in 10 years time? Even if I don't want the characters to look like this, I think its impressive. I think that Grassetti's Character Designs are impressive! Pikachu looks furry in the design which is similar to Detective Pikachu's design in his movie coming on May 10th, 2019!